Available is aParadigm Atom Monitor v7 bookshelf speaker pair. SUITABLE AMPLIFIER POWER RANGE 15 - 80 watts. SENSITIVITY ROOM / ANECHOIC 90 dB / 87 dB. WEIGHT 10.5 lbs. IMPEDANCE Compatible with 8 ohms. PARADIGM ATOM MONITOR V.5 BOOKSHELF SPEAKERS PAIR (2 Speakers total) - Grill Covers (2). USED - SHOW A FEW LIGHT SCRATCHES, SMUDGES FROM NORMAL USE - TESTED AND WORKING - SOUND GOOD. We are excited for you to receive your item! Available is the Paradigm Mini Monitor v7 bookshelf speaker pair in black. Mini Monitor v7 Specifications. Suitable Amplifier Power Range. Room / Anechoic. Specifications are subject to change without notice. UP FOR SALE IS A PAIR OF PARADIGM ATOM MONITOR V.6 BOOKSHELF SPEAKERS. Paradigm Mini Monitor V.6. THESE SPEAKERS WORK GREAT, FLAWLESS WORKING ORDER. BOTH TWEETERS AND BOTH WOOFERS WORK HOW THEY SUPPOSE TO. Paradigm Monitor 3 v.4 Speakers - Pair - Tested and working. Speakers sound great. There are scuffs/scratches on the exterior wood, especially the bottoms. Paradigm Mini Monitor V3 Bookshelf Speakers Pair Cherry *SUPER NICE* Gently Used. These speakers are in beautiful, clean condition. 9/10 just 2 tiny nicks (see photos). Cherry finish looks great! Grilles are perfect. Speakers work & sound great - nothing blown, well cared for by one owner. Original box is not included, but will be very safely packed in a similar box. Sold as is without returns unless item is not as described. Please bid/buy with confidence as we maintain 100% positive feedback on eBay for 19 years and counting. ** Paradigm Mini Monitor V6 Bookshelf Speakers. Speakers work great!! Listing is for what you see in picture. Except some kind of wear from use. Minor corner nick as shown. Possibly the best sounding bookshelf speakers ever made. Amazing sound. This is for a single Monitor series v3/v4 tweeter. Paradigm Audio mini monitors, black, rear ported, bookshelf sized, in great cond. Condition is Used. Local pickup only. Paradigm Monitor Sub 12 Subwoofer. Condition is Used. Shipped with USPS Parcel Select Ground. The sub has about 2 years worth of use. This is for a single Monitor series v3/v4 woofer from Monitor ADP 370s. These are a great upgrade for Monitor v1 and v2, along with the older 7se, and mids on 11se. Not ideal for Mini Monitors or any other single woofer model due to impedance. Up for sale is a Pair of Paradigm Tower Speakers Monitor 9. Design: 3-driver, 2-1/2 way bass reflex, quasi-3rd-order resistive port, floorstanding / tower. Suitable Amplifier Power Range: 15 - 200 watts. UP FOR SALE IS A PAIR OF PARADIGM MONITOR 7 V.2 FLOORSTANDING SPEAKERS. 3-driver, 2-way bass reflex. Quasi- 3rd order resistive port, floorstanding / tower. BOTH SPEAKERS ARE IN EXCELLENT WORKING ORDER. Paradigm 6-1/2" Woofer Pair from Mini Monitor V.2 Speakers Fully Tested! Bookshelf Speakers. 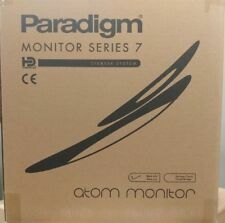 PARADIGM ATOM MONITOR V7 (EACH). Atom Monitor v7 Specifications. Design 2-driver, 2-way bass reflex, quasi-3rd-order resistive port, bookshelf / stand-mounted. More Reference technology, ensuring a smooth, wide panorama of audiophile-quality sound. PARADIGM MONITOR 9 V7 (EACH). Monitor 9 v7 Specifications. More Reference technology, ensuring a smooth, wide panorama of audiophile-quality sound. Floor Standing Speakers. Advanced S-Pal™ Satin-Anodized Pure-Aluminum Bass/Midrange Cones. Monitor Center 1 v7 Specifications. Our Monitor Series 7 is a classic example. Since its inception, the Monitor Series has been a favorite of audiophiles on a budget — with Series 7, that hasn’t changed. The tweeter in the middle crosses over to the midrange below it at 3 kHz, which in turn crosses over to the pair of woofers to either side at 550Hz. Paradigm Monitor Center 1 s.7 ( Series 7) 3-Way (4-driver) Center Channel Speaker in Black Ash. 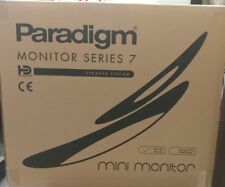 PARADIGM MONITOR 7 V7 (EACH). Monitor 7 v7 Specifications. More Reference technology, ensuring a smooth, wide panorama of audiophile-quality sound. Floor Standing Speakers. Advanced S-Pal™ Satin-Anodized Pure-Aluminum Bass/Midrange Cones. PARADIGM PHANTOM STEREO STUDIO MONITORS BOOKSHELF SPEAKERS SOUND FANTASTIC! Paradigm Phantom stereo speaker system. The speakers have been carefully tested and they are in excellent working order. These are great sounding high definition speakers. Cosmetic condition is used. One logo badge is missing. The speakers will be carefully packaged for safe delivery. Suitable Amplifier Power Range. We cater to music enthusiasts and audiophiles, and we love what we do. We design audio systems for all budgets, from entry-level to high-end. New in Box! Recent closeout! STANDS NOT INCLUDED. PRICE IS FOR A PAIR. Up for your consideration is this pair of Paradigm Monitor 7 tower speakers, which are in great working condition and sound great. Speaker cabinets have the expected scuffs as seen in the photographs. 2-driver, 2-way bass reflex, quasi-3rd-order resistive port, bookshelf / stand-mounted. Suitable Amplifier Power Range. We cater to music enthusiasts and audiophiles, and we love what we do. We design audio systems for all budgets, from entry-level to high-end. Works fine, just do not have space for it anymore! Monitor 7 v7 Specifications. Suitable Amplifier Power Range. Room / Anechoic. 3-driver, 2-1/2-way bass reflex, quasi-3rd-order resistive port, floorstanding model. Specifications are subject to change without notice. Paradigm studio 10 v.5. Condition is Used. Shipped with USPS Parcel Select Ground. If you're looking for an audiophile grade subwoofer without breaking the bank, Paradigm Monitor series cannot be beat. Single driver, acoustic suspension, built-in advanced Ultra-Class-D™ amplifier, USB port for PBK?equalization, removable grille. UP FOR SALE IS A PAIR OF PARADIGM COMPACT MONITOR SPEAKERS. BOTH SPEAKERS ARE IN BRAND NEW CONDITION. EVERYTHING WORKS FLAWLESSLY, NO ISSUES AT ALL. NO PUSHED IN DUST CAPS, NO PUSHED IN TWEETERS, OR BROKEN RUBBER SURROUNDINGS. COSMETICALLY SPEAKING BOTH SPEAKER CABINETS SHOW NO SURFACE SCRATCHES AND NO DINGS. PLEASE CHECK THE PICTURES AND LET YOUR EYES BE A JUDGE. BOTH GRILLS LOOK BRAND NEW, NO HOLES, PULLS, RIPS OR STAINS. THEY HAVE CONSECUTIVE NUMBERS. PLEASE FEEL FREE TO CONTACT US IF YOU NEED MORE INFO. THANKS. 2-driver, 2-way bookshelf / stand-mounted Compact Monitor Specifications Design 2-driver, 2-way bass reflex, quasi-3rd-order resistive port; bookshelf / stand-mounted Crossover 3rd order electro/acoustic at 2. FINISHES Black Ash. We cater to music enthusiasts and audiophiles, and we love what we do. We design audio systems for all budgets, from entry-level to high-end. SUITABLE AMPLIFIER POWER RANGE 15 - 175 watts. Three (3) great quality paradigm Cinema 330 v.3 speakers. They are in superior overall shape with no apparent wear or tear. Color: Black. The cabinets are in very good condition. The speakers sound incredible with wonderful highs and lows. One speaker has the cloth slightly loose on one corner but it does not show at all. You can do it with a short piece of speaker wire. Paradigm Monitor Sub 12 New In Box Made in Canada.300 Watt RMS - 900 Watt Peak. This Subwoofer is wireless and PBK ready. (accessories not included in the sale). PARADIGM EXPORT MONITOR Audiophile Stereo Performance Series SPEAKERS NEW! UP FOR SALE IS A PAIR OF PARADIGM EXPORT MONITOR SPEAKERS. BOTH SPEAKERS ARE IN BRAND NEW CONDITION. EVERYTHING WORKS FLAWLESSLY, NO ISSUES AT ALL. NO PUSHED IN DUST CAPS, NO PUSHED IN TWEETERS, OR BROKEN RUBBER SURROUNDINGS. COSMETICALLY SPEAKING BOTH SPEAKER CABINETS SHOW NO SURFACE SCRATCHES AND NO DINGS. PLEASE CHECK THE PICTURES AND LET YOUR EYES BE A JUDGE. BOTH GRILLS LOOK BRAND NEW, NO HOLES, PULLS, RIPS OR STAINS. THEY HAVE CONSECUTIVE NUMBERS. PLEASE FEEL FREE TO CONTACT US IF YOU NEED MORE INFO. THANKS. 2-driver, 2-way bookshelf / stand-mounted Export Monitor Specifications Design 2-driver, 2-way bass reflex, quasi-3rd-order resistive port; bookshelf / stand-mounted Crossover 4th order electro / acoustic at 1. Mini Monitor v7 Specifications. 2-driver, 2-way bass reflex, quasi-3rd-order resistive port, bookshelf / stand-mounted. Suitable Amplifier Power Range. Room / Anechoic. Maximum Input Power. 15 - 100 watts. Condition is excellent. Only used for a few months. 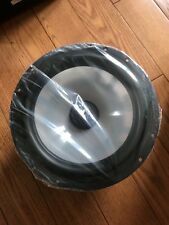 Buyer receives 1 lightly used speaker in original manufacturer packaging. Suitable Amplifier Power Range. 15 - 80 watts. ±2dB from 125 Hz - 15 kHz. Frequency Response 30° Off-Axis. Black, Silver. Maximum Input Power. Frequency Response On-Axis. High Frequency Driver. Pair of Paradigm Monitor Speakers 13" H x 11" D x 8" W. Two (2) total speakers. Since its inception, the Monitor Series has been a favorite of audiophiles on a budget — with Monitor Series, that hasn’t changed. Advanced Carbon-Infused Injection-Molded Polypropylene Bass Cones: The high mineral content and injection-molding process have created a durable and rigid cone.